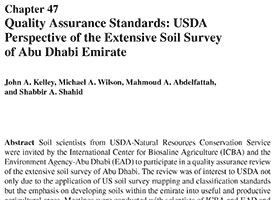 Soil scientists from USDA-Natural Resources Conservation Service were invited by the International Center for Biosaline Agriculture (ICBA) and the Environment Agency-Abu Dhabi (EAD) to participate in a quality assurance review of the extensive soil survey of Abu Dhabi. The review was of interest to USDA not only due to the application of US soil survey mapping and classi fi cation standards but the emphasis on developing soils within the emirate into useful and productive agricultural areas. Meetings were conducted with scientists of ICBA and EAD and the soil survey management team of GRM International (Australian mapping contractor) to review various aspects of soil mapping, soil survey documentation, and day-to-day operational procedures. Field visits included examination of representative polygons of preselected map units with on-site investigation by backhoe and hand dug pits traversing a widely diverse set of landscapes and landforms across several regions of the Abu Dhabi Emirate. Processes for soil pedon examination, recording of soil properties, classi fi cation of soils, mapping procedures, and determination of map unit composition were evaluated. Additional methods used within the USA were presented for consideration when conducting future soil surveys. Laboratory procedures used in the analysis of soil samples were based primarily on USDA-NRCS methods, and derivations unique to the Abu Dhabi soil survey were reviewed. In support of ongoing cooperative efforts between the agencies of USDA, ICBA, and EAD, soil samples were collected for detailed analysis in an effort to develop new methodology for identi fi cation and quanti fi cation of anhydrite, as well as elucidate the mechanism and controlling factors for the formation of this mineral in soils of the region. Field and laboratory methods, standards, and procedures implemented by the project team (both ICBA/EAD and GRM) with their high level of technical skills, knowledge, and experience have ultimately yielded an array of high-quality soil survey products greatly enhancing the wise use of one of the region’s most precious natural resources—its soil.